As you can see from the links, “gagaku” is mentioned often: this is court music which originated in the Heian period, and is still performed today. A gagaku ensemble is lead by the concert master, playing the kakko, and includes several different instrument types. Taking into consideration the akomeougi, which hint at demure Heian ladies who would be behind them, it seems likely that my kurotomesode is meant to suggest a small Heian court concert. 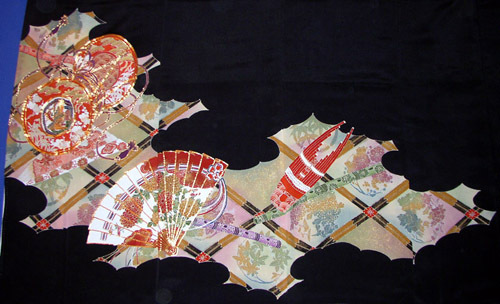 In addition, the significance of autumn and winter motifs in the dyed background circles becomes clear from the section on symbols in the book The Techniques of Japanese Embroidery: “The arrival of lengthening nights of autumn signaled the time for reading and music.” “Musical instruments […] suggest autumn. 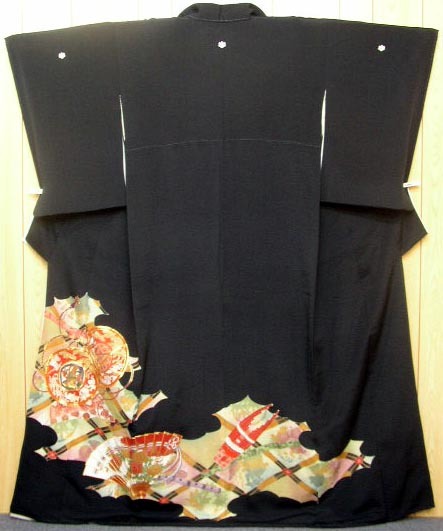 The most sophisticated music of court life was that derived from ancient Chinese court music and dance, called gagaku.” Thus the motif is, unsurprisingly, very appropriate for a kurotomesode, the most formal of kimono for married women. I love formal kimono for the treasure hunts in symbolism they offer, and will be sure to add anything new I discover once I receive this one in the mail and get to see it in real life. This entry was posted on Wednesday, October 29th, 2003 at 17:29:01	and is filed under General. You can follow any responses to this entry through the RSS 2.0 feed. You can leave a response, or trackback from your own site. Fastidious replies in return of this issue with firm arguments and explaining all about that.